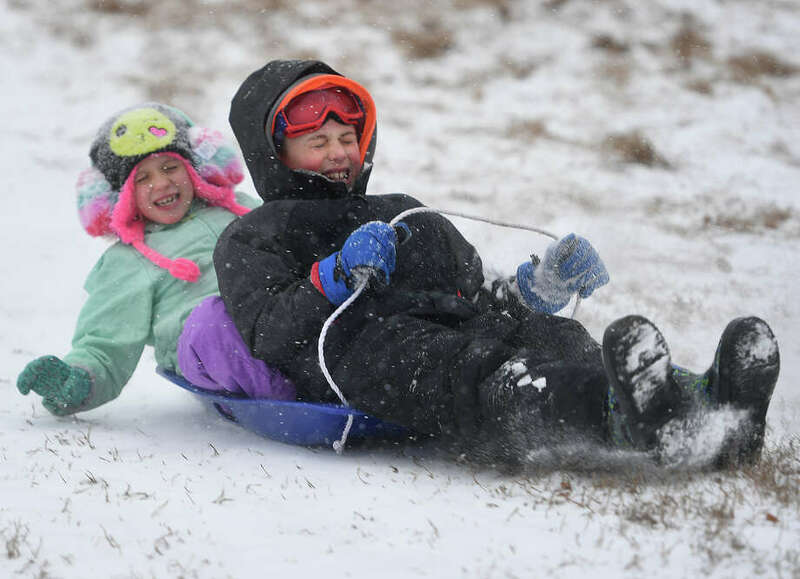 Siblings Anne, 6, and Ethan Arnett, 8, of Fairfield, enjoy a snow day off from school with a morning of sledding at Sturges Park in Fairfield, Conn. on Tuesday, February 12, 2019. Here’s the latest storm information from the National Weather Service regarding Tuesday’s storm. A winter weather advisory remains in effect until midnight Wednesday. For the remainder of the evening, mixed precipitation is expected. Total snow and sleet accumulations will hover between 3 and 5 inches. Ice accumulations of one- to two-tenths of an inch are expected. Highest snow, sleet and ice accumulations are across the interior part of the state. How much snow is expected? The shoreline: Between 2 to 3 inches. Interior Fairfield, New Haven and Middlesex counties: 3 to 4 inches. Litchfield County: 4 to 6 inches. Far Northwest Corner of CT, Berkshires of western Mass: 6-8 inches. 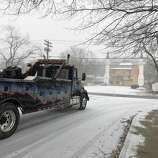 When will the snow and mixed precipitation start and end? 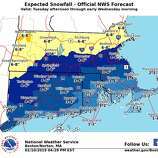 Snow will be heaviest from 10 a.m. to 4 p.m. Freezing rain is likely in interior Connecticut from 4 to 7 p.m. Once the snow transitions to a wintry mix, sleet and freezing rain will be the main threat. Only a brief period of freezing rain appears to be possible along the coast before going over to all rain. Rain is likely from 9 a.m. to 4 a.m. Wednesday. Will there be a big freeze-up after the snow and mixed precipitation? As warmer air moves in, temperatures will rise above freezing in the early evening. Because temps will be in the mid-30s overnight there should be no flash freeze. The biggest threat of icing comes during the transition from snow to mixed precipitation in the afternoon and early evening. Ice accumulations of up to a quarter inch across interior CT and one-tenth of an inch along the coast. Will there be strong winds like previous storms? The strongest winds could come from mid-morning Wednesday through the afternoon with winds between 10-14 mph. Strongest gusts of 28 mph are expected. This forecast the greater Danbury area. Tuesday: Snow before 2 p.m., then snow and sleet between 2 and 5 p.m. then snow, freezing rain, and sleet after 5 p.m. Steady temperature around 23. Wind chill values between 10 and 15. East wind 8 to 11 mph. Chance of precipitation is 100 percent. Little or no ice accumulation expected. New snow and sleet accumulation of 3 to 7 inches possible. Tuesday Night: Freezing rain and sleet before 9 p.m., then rain and sleet between 9 and 10 p.m., then rain after 10 p.m. Temperature rising to around 36 by 11 p.m. Wind chill values between 15 and 20. East wind 9 to 14 mph becoming light and variable after midnight. Chance of precipitation is 100 percent. New ice accumulation of less than a 0.1 of an inch possible. New sleet accumulation of less than one inch possible. Wednesday: A 20 percent chance of rain before 8 a.m. Partly sunny, with a high near 42. Wind chill values between 25 and 30. West wind 10 to 16 mph, with gusts as high as 28 mph. Wednesday Night: Partly cloudy, with a low around 25. West wind 9 to 13 mph, with gusts as high as 23 mph. Thursday:Mostly sunny, with a high near 43.